While on crow patrol last night (April 14) at 7 PM we were sitting on the south side of the Merrimack River in the Philip J. Riley Park (looking north – across the river parked along a fence) in Lawrence, MA. Slightly to our right at the beginning of the road entrance to the park, at the edge of the grass, someone had thrown many old big rolls. We were parked there, I hardly have to say why – watching the evening spectacle of crows across the river and a small flock – many Fish Crows to our right. We have found it easier to watch the crows stage from the south side of the river either from the boathouse on Eaton St. or now this park. There were some leafless small trees along the river and this pile of rolls on a slight mound to our right. Suddenly, both the nearby crows and many gulls started to gather. More and more gulls – some dropping down to grab a roll. I cried out, “Bob white-winged Gulls”. In the end there were at least 4 Iceland Gulls and a Glaucous – all so white. This was April 14th in Lawrence at 7 PM. There were so many gulls. They swirled, dipped to the water, chased one another, some dropping down to feed and kept making circles up and down the river in front of us. Fish crows now quite easy for us to identify in the field were also feeding and moving from the water’s edge to the ground and to the rolls. Now it was hard to focus – we had to keep an eye on the thousand plus crows across the river who were much farther east than any other night and all these gulls. 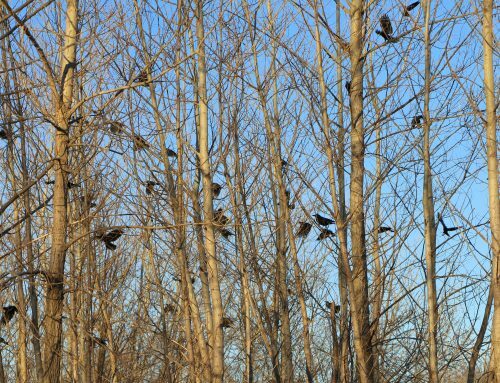 Finally, when the crows started moving east to roost, we had to snap back on Crow Patrol and head over to the other side of the river. 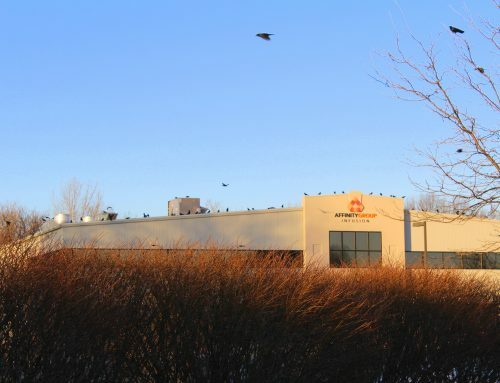 We stopped in the little gray house of the end of December-early January fame just off Broadway St. at the first turn in on the north side to see the gulls which were now roosting along the south side of the river JUST above the dam. Bob counted 340 roosting gulls !!!! but they were too far away, and our scope was at home to see them well and the crows were on the move. 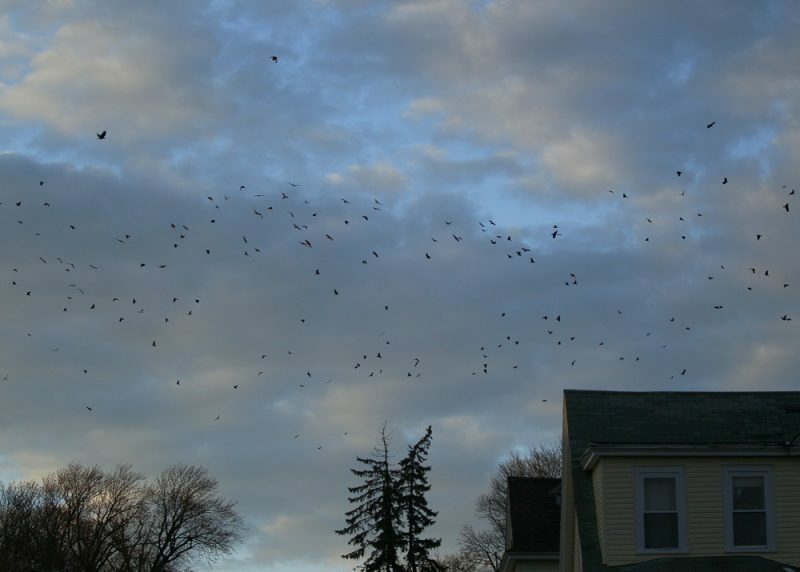 The crows seemed to be as far east as the Lawrence Girl and Boys Club off Water Street. We pulled in behind the club and found they were still to the west of us. We had to get nearer the river and went down Caukling St. and found a bumpy old dirt road running parallel to the river with just a few big trees right along the river. This road it appears is used for parking for the many multifamily dwellings. It was dark now and we were off in unfamiliar territory but carry on we did. 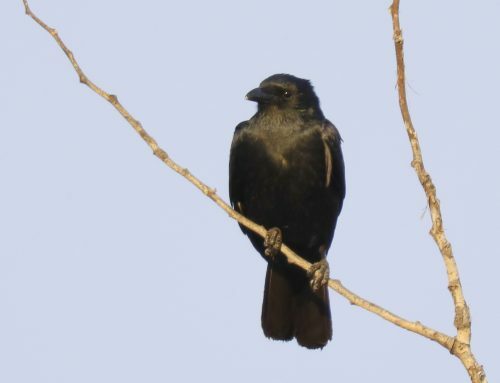 The crows were in a furtive mood – I have never seen them so undecided – they would fly to one set of trees along the river and then move further north amongst these dense multifamily, multistory building to the few tall trees. They were beside us then, in front of us and back of us – on and on it went. It was quite dramatic in the dark of night with these huge flocks milling around us. Finally, after 8 PM they left the river area and we went back to Water St. where we could see them now and then in trees to the north of us. We pulled down this narrow ally – Thornton St. and found a group at the end of the street densely perched across in this big tree. Yes, I do now shudder to think how we have so brazenly moved around Lawrence the past few months. Never could I have projected it. Having Bob to accompany me has made a big difference. 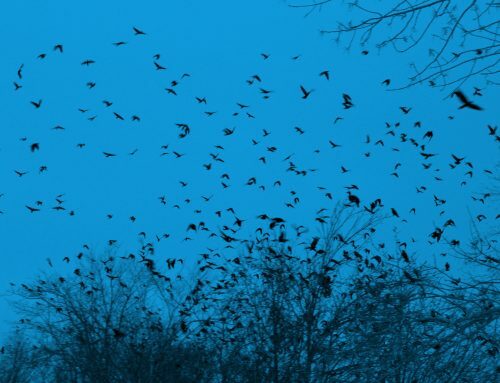 Also, when I reflect how many nights I have been in cemeteries and behind churches, I feel the crows are surely protecting us! 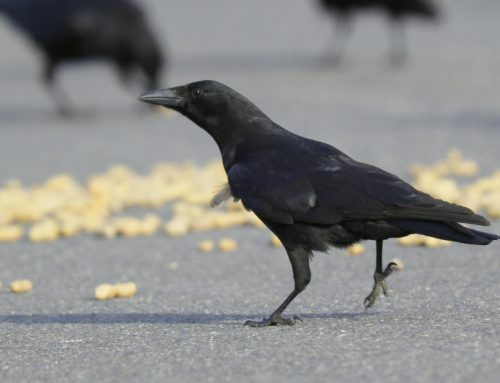 We have concluded on some thin evidence that the crows still roosting are sub-adults that have not either migrated north to their nesting territories or permanent residents that have moved with their cooperative helpers to their nesting territories in MA and southern NH. You all missed an exciting night – again something new!! !